In the previous issue, we saw some startling things. Mel, an old friend of Eve who has been in a mental care institution for several years now, is back on her feet almost as soon as Eve comes to meet her, and this dovetails into some of the strange goings-on in the town that Eve is investigating. But none of it is as it seems and this issue shows that there is indeed a very dark, and very terrible, twist to everything. Eve and Nate, another old friend of Eve’s and Mel’s boyfriend, both have some really trying times ahead of them and they have to rethink a lot of what they believe is possible and impossible. In the previous three issues we had a fairly steady build-up to the big reveal of what exactly is happening in the town and what Eve’s role in all of it is. In the new issue we see some more of what exactly that entails. Because of all the dallying in black magic that Eve, Mel and Danielle did as teenagers almost a decade ago, something terrible was unleashed, and now that thing is set to consume everything in its path. And its agent is someone unexpected, someone that Eve happens to know quite well. It was all quite thrilling to read and I believe that Kittredge handled this partial reveal fairly well. I don’t really have a criticism against it except that I wanted more. But such is the nature of periodical comics. I strongly suspect that reading the entire series back to back, in collected form, would prove to be most rewarding. The highlight of the issue however is definitely the exploration and substantiation of the relationship between Mel and Eve, and Danielle and Eve. The former is all in the present while the latter is all in the past, told as flashbacks. They were all rebellious kids growing up and Eve was the worst of them all, you could say. Her relationship with her friends was real, and it was stormy, and now the consequences of all of that are coming back to bite her in the present. There is a deep sense of betrayal she experiences in the climax of the issue, and you almost feel really bad for her. She’s already been through a lot, but there’s no sense that things are about to get better. In fact, things are going to get a lot worse before there is even a small chance that they will get better. And I love how Kittredge has handled all of that. As far as the art is concerned, aside from some minor inconsistencies with the facial expressions, and a panel here and there where Eve’s body language is really odd, Miranda and de la Cruz have done some great work. I was already a fan of the series in terms of the visual aspects and just like the previous issues, I am not disappointed with them here either. In fact, overall, I’d say that there has been a slight bit of improvement, which is important I feel. Its as if the artists are finally comfortable with the story and they really grasp the nuances of the script. The visual tone and the visual mode are almost perfect here. 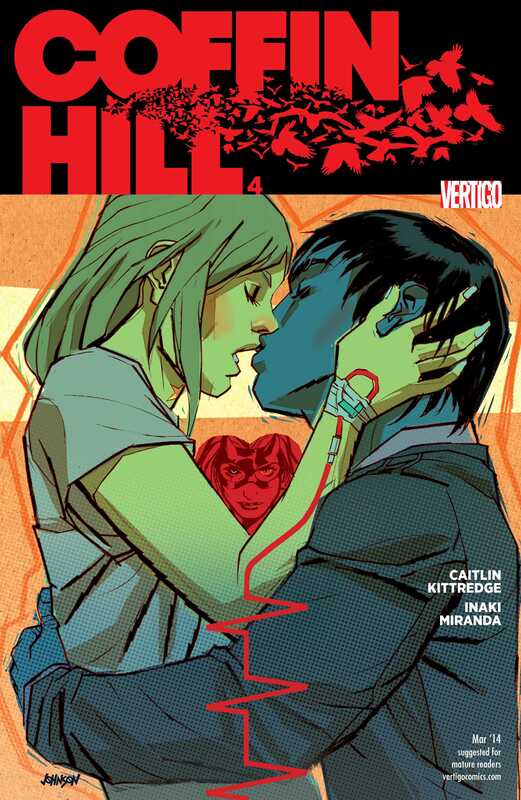 So yes, overall, one of the best issues of the series, Coffin Hill #4 is. If there is any major criticism I have of this issue, its that I don’t get what the first page is about at all. I’m confused by it. More Coffin Hill: #1, #2, #3. Posted on January 19, 2014, in Comics Reviews, Review Central and tagged Black Magic, Caitlin Kittredge, Coffin Hill, Comics, Comics Review, Eva de la Cruz, Eve Coffin, Horror, Inaki Miranda, Review, Review Central, Supernatural, Suspense, Thriller, Travis Lanham, Urban Fantasy, Vertigo Comics, Witchcraft. Bookmark the permalink. 1 Comment.